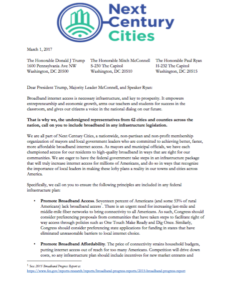 Today, Mayor James and Mayor Holland of the respective Kansas Cities joined over 60 other other mayors and city representatives in penning a letter to the new President, Speaker of the House and the Senate Majority Leader urging the federal government to keep digital inclusion in any future infrastructure plans. Improvement of infrastructure was at the forefront of the primary and general election campaign promises in 2016. Then-candidate Donald Trump even promised to spend $1 trillion dollars on infrastructure during his campaign for the presidency; though he meant roads and bridges, Next Century Cities believes that high speed internet is a part of that necessary infrastructure. Next Century Cities is a coalition for cities across the United States that fosters digital inclusion through it’s founding principles. Kansas City has been one of the leaders on the path to narrow the Digital Divide, and uses networks such as NCC to achieve a goal of digital equity. 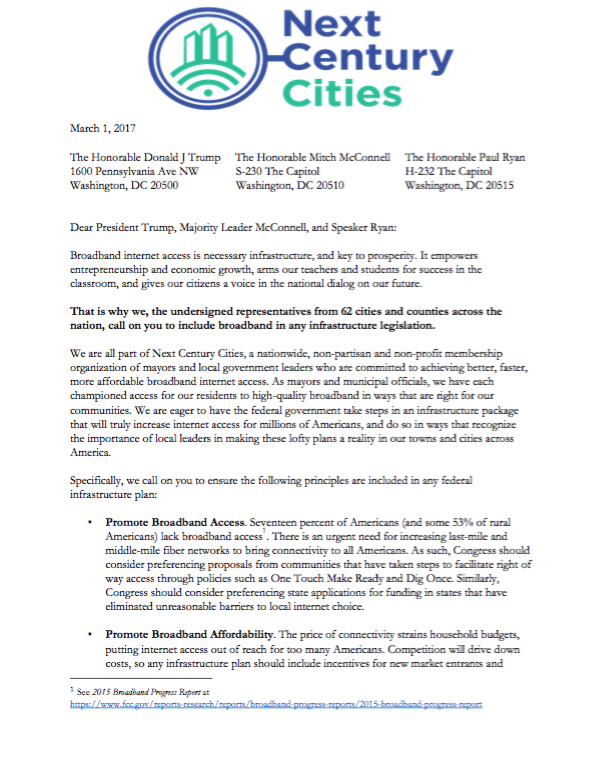 The letter specifically calls on the national government to promote local solutions for broadband access and affordability, citing local policies such as One Touch Make Ready and Dig Once, to semi-permanently fuse future physical infrastructure and gigabit infrastructure projects. Some large telecom companies such as AT &T oppose policies like these for various reasons, but NCC wants to petition the federal government to allow local municipalities to make such decisions for themselves.